NEW! Jump to a slideshow of the mural unveiling! 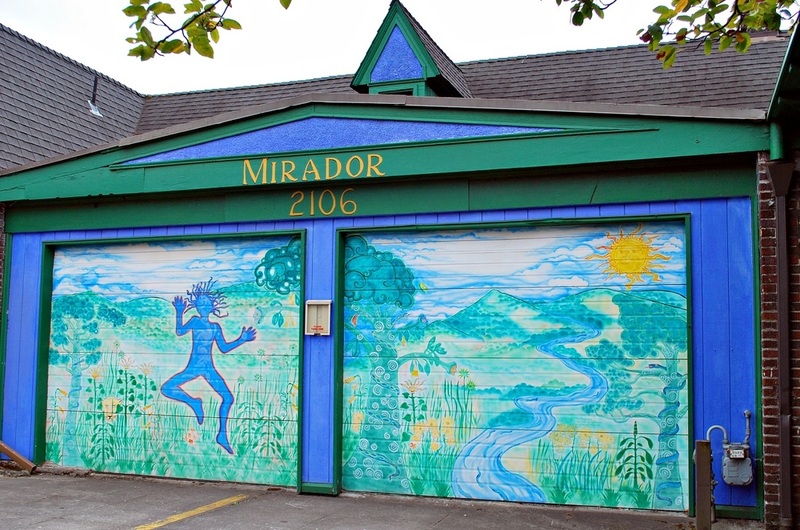 "Many of you know that Mirador for years has been caught up in the controversy over wall murals in the city of Portland. There is very good news on this front. "On Wednesday, July 1, 2009 the Portland City Council voted to approve a new mural program for Portland, which will actually make a third option available to building owners and artists. "Importantly for us, it should allow the boards covering 2/3 of the Mirador mural to come down after we go through a permitting process. The boards went up in 2005, the mural was painted in 2002. If you don't know the mural story or just want a refresh, the following time line will give you the basics of how this all came to be; how a city as vibrant as Portland held murals at bay for years! "We want to thank Portland Mural Defense, artist Joe Cotter and mural activist Joanne Oleksiak, the many mural artists in Portland, the City of Portland and mural supporters in our fair city for the patience and willingness to slog through this for years to make this new program happen. Life is short, Art is long!" 1998 – The City of Portland is sued by AK Media (later to be bought by Clear Channel), claiming discrimination because the city exempted wall murals from the city sign regulations. AK Media contended that their free speech rights were being violated and the court agreed, saying that it was unconstitutional for the city to discriminate between two types of free speech. The city either had to choose to either not regulate signs at all or to regulate murals as signs. The city chose to regulate murals as signs and thereafter, murals had to be under 200 square feet and obtain sign permits. All previously existing murals in Portland were grandfathered in; even the location of a mural was grandfathered, so an older mural could be changed even if it was over 200 square feet. A chill descends on the community of murals artists in Portland and fewer murals are painted. 2002 – In July of that year, we inadvertently enter the mural fray when we commissioned Gwyllm Llywdd, a local artist and a good friend to paint a mural on the garage doors of our building. 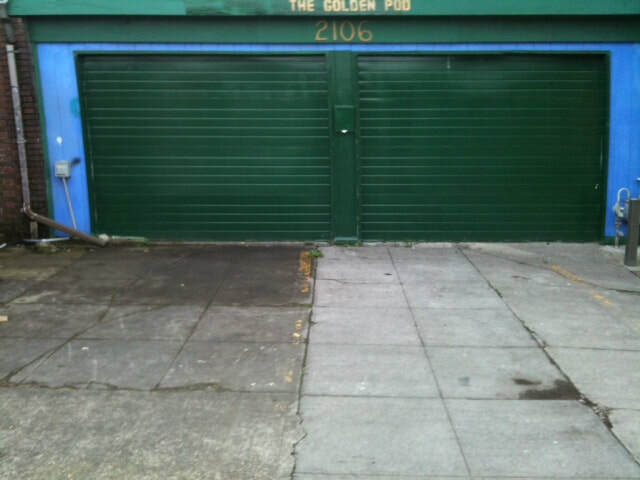 The mural is painted, it's lovely, our customers and neighbors enjoy the addition to the garage doors. We knew there was an issue around murals so before Gwyllm got started, we called a couple of agencies and learned we could have a mural under 200 square feet. The problem was that this was not true for our zoning which at the time was Neighborhood Commercial. As we would learn later, since the mural would be a sign, there are different size limitations based on zoning. 2003 – In July 8, we receive a citation from the city saying we are in violation of the city sign code and that we have two days to paint over the "sign" or be fined $50 a day penalty. At first we thought there was some mistake, but then we realized that by sign, the city meant the mural. Portico, further east on Division received the same citation. The next day, there was an article in the Oregonian by Fred Lesson on the front page of the Metro section titled "Stores ordered to paint over murals". By the end of that day, so many people had called BDS (Bureau of Development Services) to complain about the heavy handedness that we received a phone call saying that the citations were on hold. Later that same month, we receive a visit from Commissioner Randy Leonard, head of BDS. He wants to try and work something out so that we can keep the mural, calling the ordinance absurd. His thought is to change the sign code but is cautioned by then Mayor Vera Katz, saying that selective nonenforcement of the sign code could open the city to another lawsuit. The mural problem drops into the background and we have a breather. 2004 – In March, we receive another citation from the city, threatening action unless we make our mural a legal sign. We choose this option, and in July cover up all but 60 feet of it, post our sign permit and figure we'll wait it out. We hated to board it up, but needed to get the city off our backs and also felt that the physical act of covering up part of our mural made a great statement about where things were; that we had to act as if art and advertising were the same when we all know they are not! This same year, Mayor Vera Katz convened a panel of artists and other stakeholders to find a solution to the mural dilemma. This resulted in a new program for murals called Public Art Mural. 2005 – The Public Art Mural process is added as an option for muralists in the City of Portland, so now there is an additional process to the sign code avenue for mural creation. The Public Art Mural process is administered by RACC (Regional Arts & Culture Council), meaning that murals that go through the process are paid for by the public and owned by the public. We supported the creation of this program, knowing that more murals would be painted with it but that it would not help Mirador; we had an existing mural and lived in sort of a mural limbo. Over 20 murals have been created as a result but because it does not provide an avenue for the creation of murals on private property which would not become part of our public art, another option was needed. 2007 – The City of Portland is back in court with Clear Channel, formerly AK Media. The original 1998 case had been subject to appeals back and forth between the city and AK Media, concerning both the decision and the monetary reward. Initially, AK Media won not only the lawsuit but $1 milllion from the City of Portland. In this 2007 trial, Judge Marcus allowed mural activist Joe Cotter to intervene, so for the first time the mural arts community has representation. Judge Marcus eventually rules that it would be legal for the to regulate signs & murals differently which opened the channel for the to look into a third option for mural creation. 2008 – Mural artists worked with then-Commissioner Sam Adams and Mayor Potter to form a working group to find ways to use the 2007 court decision to create a new mural program. The group that formed had representatives from Bureau of Development Services, City Attorney's office, mural artists and activists. 2009 – The efforts of the working group results in the Original Art Murals Project. In May of 2009, the Planning Commission takes public testimony on the proposed program and indicates by vote that the board will recommend approval to the City Council. July 1, 2009 – The City Council of Portland approves the new mural program called Original Art Murals Project, which should be open to permit applications by July 31, 2009. October 9, 2009 – The city gives us approval to remove the boards covering the mural. Gwyllm LLywdd presided over the ceremony with help from muralists Joe Cotter and Mark Meltzer. Joanne Oleksiak, a passionate supporter of murals, joined a group of neighbors and us to help celebrate the occasion. Below USED TO BE a slide show of the mural unveiling. For some reason it no longer works. But if you click the photo it will take you to the Flickr site where you can see the photos. The November issue of The Southeast Examiner also has a story about the mural saga. Neighborhood notification will be one of the steps in the permitting process. Murals will not be allowed to be painted on bricks or stone walls. The mural will need to stay on the wall for at least 5 years. The mural cannot exceed a height of 30' from the adjoining grade. It prohibits compensation being given or received for the ongoing display of a mural. There are additional standards for murals in design overlay zones. The application process cannot make any provisions that regulate the content or message of a mural, so it is understood that some commercial murals will be created. Mostly what is expected though is that this new program will give birth to many new murals and the process will be open to more muralists and building owners. Joe Cotter died of cancer March 31, 2012. His contribution to the art scene in the Portland area, especially in murals, cannot be overstated and he is sadly missed. 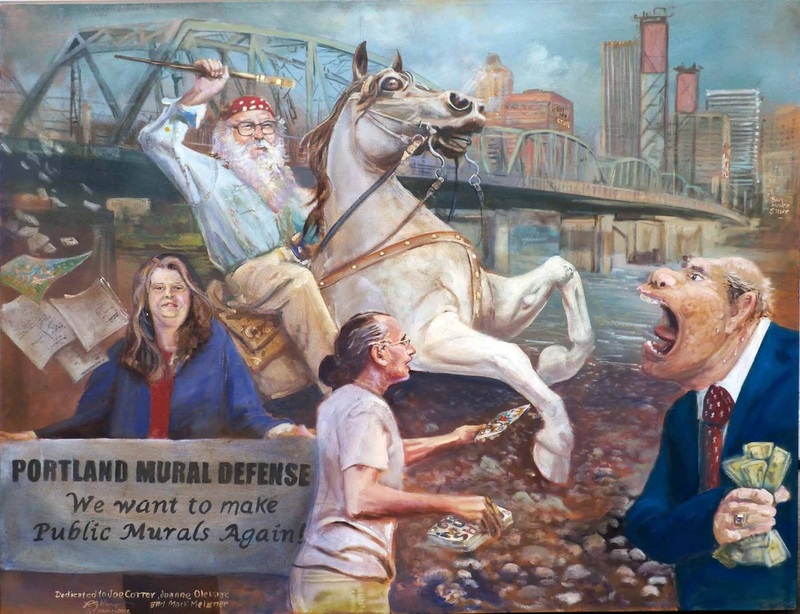 Below is a painting done by Larry Kangas of Joe taking on Clear Channel with support from Joanne Oleksiak and Mark Meltzer (also a muralist) of Portland Mural Defense . This painting was on display at a farewell party for Joe held at Edgefield just prior to his passing. Early in 2017 someone tagged the mural. Gwyllm tried to paint it out but it couldn't be done. A little while later someone graffitied most of the mural (this is happening all over Southeast Portland; it used to be taggers and graffitiists would leave murals alone; no longer). After we closed Mirador, the owner of the building painted over the mural (and other graffitied areas) so help sell the building. Below if what it looks like now. Very sad.